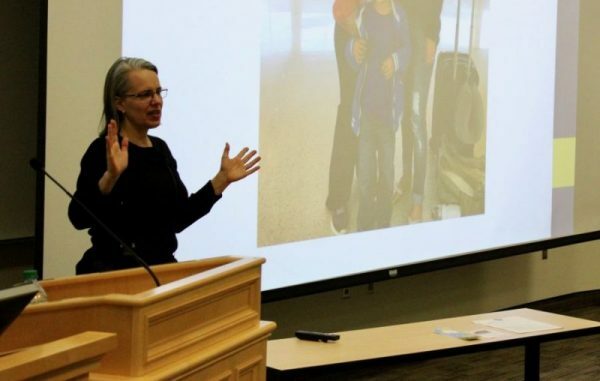 At a Women’s Studies Colloquium, BYU law professor Kif Augustine-Adams discussed the Central American refugee crisis and her pro bono work in Dilly, Texas, helping women and children seeking asylum in the United States. PROVO, Utah (Jan. 20, 2017)—Since 2014 there has been a surge of Central American refugees coming to the United States – more specifically, women and children fleeing from incredible danger, violence and oppression. To paint a better picture of the United States’ response to this influx of refugees, Kif Augustine-Adams, Charles E. Jones Professor of Law, shared experiences from her pro bono work with BYU law students in Dilly, Texas, and how helping refugee women tell their stories the right way allows them to avail themselves of asylum. Augustine-Adams stressed that often the way we frame the narrative of this influx of migrants coming to the United States can lead to harmful misconceptions about refugees. Many think of these migrants, or refugees, as people illegally invading the border, when in reality many are women and children arriving in search of asylum. “What I want you to know is that the law, both international and of the United States, allows these women and children and other migrants to come to our border and claim asylum,” Augustine-Adams said. Augustine-Adams defined a refugee as a person outside of his or her home country who is either unable or unwilling to return because they can no longer receive protection from their own government. To seek asylum a refugee must meet certain requirements outlined by international law. Such requirements include persecution based on race, religion, nationality, membership in a particular social group, or political opinion. It is often under persecution for being a member of a particular social group that women and children fleeing violence – domestic or otherwise – can categorize their right to refuge. The United States’ response to this recent influx of immigrants has been to build family detention centers. In these centers conditions are far from ideal. Lawsuits have also been filed against the Obama administration, as some refugees are temporarily placed in cold, concrete holding cells with surveillance cameras, while others are kept in large cages in warehouses. Border guards are also turning refugees away before they have even illegally crossed, which Augustine-Adams said violates international law. Additionally, the detention centers – many of which are located in rural Texas – have very little legal counsel to offer. Augustine-Adams said that in one area, there were only ten lawyers in the entire town. Legal counsel is often crucial for refugee women to pass a credible fear interview, which, if passed, allows them to leave the detention center and enter the United States. Refugee women are often unable to tell the ‘right’ story, however, because they are unfamiliar with international asylum laws. This is where lawyers, translators and volunteers can make a big difference. With the help of a Mentored Environment Grant, Augustine-Adams has been able to take BYU students to a detention center in Dilly, Texas, and provide legal counsel to detained women. “Our job as volunteers at Dilly was to help people learn how to tell their story in the ‘right way,’ to frame their experiences in a way that would convey to the asylum office who was doing a hearing with that individual person that there was at least a 10 percent chance that she was going to be persecuted if she returned,” Augustine-Adams said. But who is seeking asylum, and why are they leaving? To help people better understand why these refugees are fleeing Central America, the United Nations published an article in 2015 providing first-hand accounts of women fleeing El Salvador, Guatemala, Honduras and Mexico. The article reports that overall, Central America has the highest per capita death rate in the world apart from a war zone.